Tensions are always of past or future which comes to your mind if you will open your mind's doors. If you will get success to close these doors, no tension will come. So, for closing the doors of past and future, you have to leave in present. For stopping tensions, you have to ask yourself what bad things will happen with this. For example, if someone is scaring to you and you are fearing from him. It means, you are already killing yourself by fearing from. Ask yourself what can he do? Maximum, he will kill you. Ok, I accept this. Try to search internet, there are lots of people who died with natural happenings like tsunami, earthquake. When you will die, no one can save you. All is in the hand of God. You just accept this. With this, you will become fearless because because you have accept it with honestly. Instead of worrying, you should try to best to improve current situation. Your thinking should improve the current situations. Give time to think new ideas. These ideas will save from your current bad position. All those who will worry will die in young age. You will taking tension, it means you are inviting cancer and dead cells in your body. So, try to make understand to yourself that you are young and your blood is not cold. When you will understand it you will live long. If you are taking tension for solving your problem. You should write the problem on the paper in clear answer. Now, try to get its solution. There may be many solutions of your problem. Write the maximum solutions of your problem on the paper. Get help from other experts. If other will take money for providing you solution, then give because money is not important but solutions are important. For example, if you do not get delivery, never think that ecommerce website is cheater. There are lots of reasons for not getting delivery. So, be patient and analyze the problem with rational way. When you will cut the wood, you will get the powder. Now, never cut the powder of wood because it is wastage of your time. Now, apply it on your life. You are also cutting powder when you take the tensions. When you worry when someone dies to whom you love. When you lose money. When you lose your business. Forget what happen in past because all have become powder. So, do not waste your time to remembers all these pains. If you are carrying the milk and you see that a small mistake added your whole milk in drain. Now, you will start to cry because milk is worthy for you. But think what will happen. You will get the milk. So forget this. Like this, you should forget your tension. All tension are just milk which added in drain. When you will start to revenge, it will become costly deal for you. For example, if someone abuse you, you should not revenge by abusing him. At that time, it will convert in quarrel. So, feel peace. If you will feel peace, other will also feel peace. All those who counts their pains, are fool. We should count always our god gifts. This will give us power to live happy life. You should do any good work everyday. When you will do good work, you will feel enjoy. Your mind will enjoy more peace. If you are the patient of isomnia, never feel tension and worry this. Actually this is not disease and I am very sorry, I am saying you patient. You are fully healthy person. Just start to study any good book and you relax your whole bod. Soon, you will sleep. No one die from isomnia. Remember it. Just go to bed after some work and relax. Then do work. Then go to bed and relax. This is the balance of work. 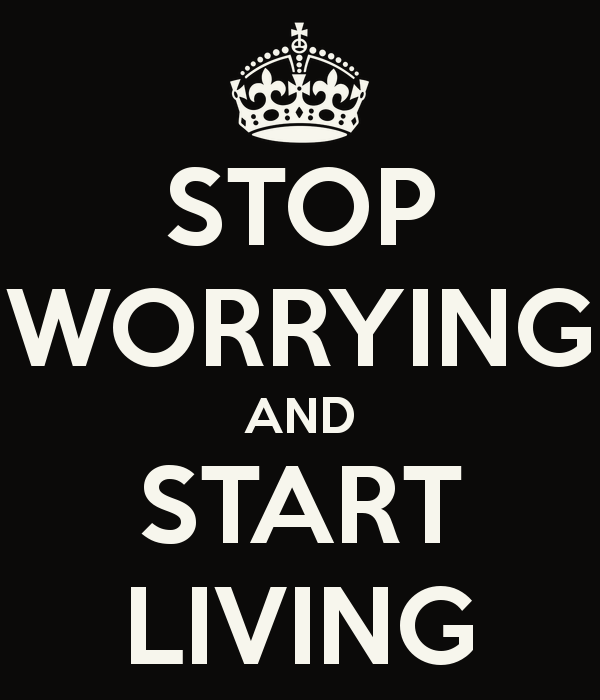 No Comment to " How to Stop Worrying and Start Living "